Throwback Thursday for January 28, 2016: Exploring ways to serve commuter students better?! Grab a cup of coffee or tea and get comfy because Mariana Regalado and Maura Smale’s article from last spring is a great read! 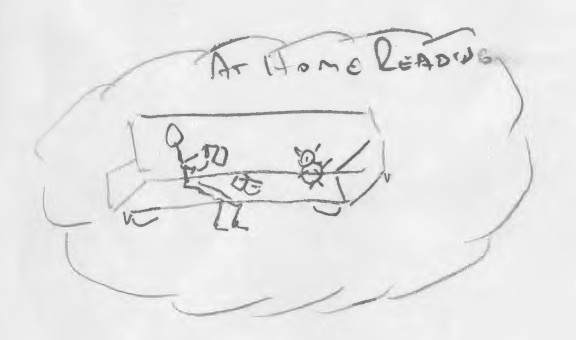 Matteo, a Borough of Manhattan CC student, drew a picture of himself sitting on the sofa at home reading for his research paper. In Brief: While commuter students may use their college or university libraries, student centers, or other campus locations for academic work, as commuters they will likely also create and negotiate learning spaces in their homes. Our research with urban commuter undergraduates revealed that finding space for their academic work at home was difficult for many students whose needs collided with the needs of other residents using those locations for non-academic purposes. Understanding the details of students’ off-campus academic workspaces can inform the design of learning spaces in academic libraries. Jessica,1 a 20-year-old student at Hunter College in New York City, woke up at about 6:00 a.m. one spring day and got ready for school. She left her home in the Bronx where she lived with her mother and uncle and his family, including her three-year-old cousin, at around 7:00 a.m. She took a bus to the subway station, then rode two different subway trains down to Hunter’s 68th street main campus, switching from the express to the local. Jessica was attending college full-time and her four classes that day began at 8:10 a.m. and continued through to 4:00 p.m., with two ninety-minute breaks during which she did homework in the library, ate lunch in the cafeteria, and relaxed by using the computers in the library. Jessica had a laptop and did some of her schoolwork at home late into the evening. However, with all of the family members living together, especially her toddler cousin, her home was often noisy and she sometimes had difficulty doing her homework there, even though she had her own bedroom. When she was on campus, Jessica often spent the time between classes working on the second floor of the library, sometimes using a computer to review course materials or print out an essay; she did not always bring her laptop to campus as she sometimes had heavy textbooks to carry. Jessica’s home was located close to the New York Botanical Garden, which she considered a retreat: she often went there to do her academic work when the weather was mild. Millions of U.S. college students, like Jessica, commute to their campus and classes rather than spend their undergraduate years in a residence hall. While commuter students may take advantage of their college or university libraries, student centers, or other campus locations for their academic work, as commuters it is likely that they need to engage in scholarly work in their homes as well. This article discusses research on ways that urban commuter college students create and negotiate learning spaces in their homes, complementing more traditional study spaces such as libraries. Understanding the details of students’ off-campus academic workspaces–the comforts and pitfalls, the benefits and constraints—can inform the design of learning spaces in libraries and on campus. This research is part of a study we conducted of undergraduate scholarly habits at the City University of New York (CUNY). We interviewed students to learn about the locations where they do their academic work, their reasons for choosing those spaces, and their successes and challenges in using them. We met with students at six CUNY colleges: Brooklyn College, City College, and Hunter College, which offer Baccalaureate and Masters degrees; New York City College of Technology (City Tech), which offers Associate and Baccalaureate degrees; and Bronx Community College and Borough of Manhattan Community College (BMCC), which offer Associate degrees. CUNY is the largest urban public university in the U.S. and enrolls approximately 270,000 students in degree-granting programs at twenty-four undergraduate and graduate schools in the five boroughs of New York City. CUNY students reflect the astounding diversity of New York City and 44.8% of undergraduates were first-generation college students in 2012 (CUNY Office of Institutional Research and Assessment, 2012a). While we did not collect detailed demographic information about the students we interviewed, we did learn a great deal about how each student’s particular living situations influenced their learning spaces, as will be shown below. At each of the six colleges we interviewed thirty students using three ethnographic research methods: photo surveys, mapping diaries, and retrospective research process interviews.2 In the photo surveys, we gave each student a list of twenty objects or locations related to their lives as students, for example “your favorite place to study” or “a place in the library you don’t like,” and interviewed each student when they returned the photos to us. For the mapping diaries, we asked each student to log their activities, including time and location, over the course of one typical school day, and also to draw their progress through the day. We also conducted retrospective research process interviews with students in which we asked them to describe and draw the activities they engaged in as they completed work on a research assignment. Our visual and interview data illuminated much detail about students’ experiences as scholars outside the classroom. CUNY is overwhelmingly a commuter university, and students spend much of their time away from campus at home, work, and other locations. Because commuting to campus was a time-consuming process, many students expressed a preference—or a need—to create their academic spaces in their homes rather than in the college library or other campus location. Some students told us that they chose to do their scholarly work at home because it was a familiar place, with all of the comforts to which they were accustomed. Others chose to complete their schoolwork at home because of external factors, for example, if their classes or job ended for the day after the college library was closed. 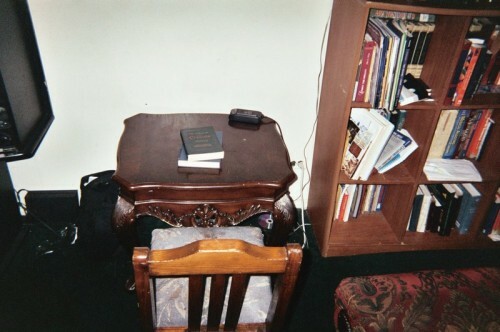 Still others acknowledged the allure of customizing their study setting when doing scholarly work in their homes. However, many students noted constraints of space, noise level, or the activities of other residents while working at home. These students, like Jessica, struggled with the impact of the overlapping activities of others on their own desire to create a meaningful academic space, and engaged in a variety of strategies in attempt to mitigate those effects. Published research on strategies used by undergraduate commuter students to create learning spaces at home is slim. The Library Study at Fresno State used interviews and student photographs to delve into the details of students’ school days, and conducted interviews in student homes as well as the dormitories. Many of their findings were congruent with what we learned at CUNY: a student often needed to create a space for their scholarly work in a room or area not intended for or solely devoted to their academic work. One Fresno student complained about his noisy roommates, and others found themselves “impacted by space limitations, shared bedrooms, and younger siblings” (Delcore, Mullooly, & Scroggins, 2009, pp. 17, 21). However, the students interviewed at Fresno also spoke of rooms used for schoolwork in addition to the living room, kitchen, and bedrooms—for example, a crafts room, office, or garage (Delcore et al., 2009, pp. 15, 17). Most students at CUNY described much more constricted home spaces, reflecting the high population density of New York City and the predominance of apartment buildings over other types of residences. Far more research, most of it quantitative, has been undertaken to ascertain the academic and social benefits and constraints for undergraduates who live in residence halls. Krause suggests that the “quality and nature of social interactions have a significant impact on university retention rates,” and that building relationships with peers can be more challenging for commuter students than for residential students (2007, p. 28). Shushok, Scales, Sriram, and Kidd report finding many advantages for undergraduates who live in dormitories on campus, including more participation in extracurricular activities, more frequent interactions with peers and faculty members, more positive perceptions of the campus climate, higher satisfaction with the college experience, greater personal growth and development, more effort and involvement in both the academic and social experiences of the college, and a higher rate of persistence and degree completion (2011, p. 14). However, a recent review of the literature found that published studies yielded a mix of evidence of both advantages and disadvantages to college students living in residence halls. Sanchez (2012) undertook a predominantly survey-based study at the University of Nebraska-Lincoln to compare the experiences of first year students who lived in a residence hall with those who lived at home and commuted to campus. Students who enjoyed living in the dorm reported that it was convenient to campus and kept them connected to the university, yet others noted difficulties with roommates and excessive noise in the dorms. 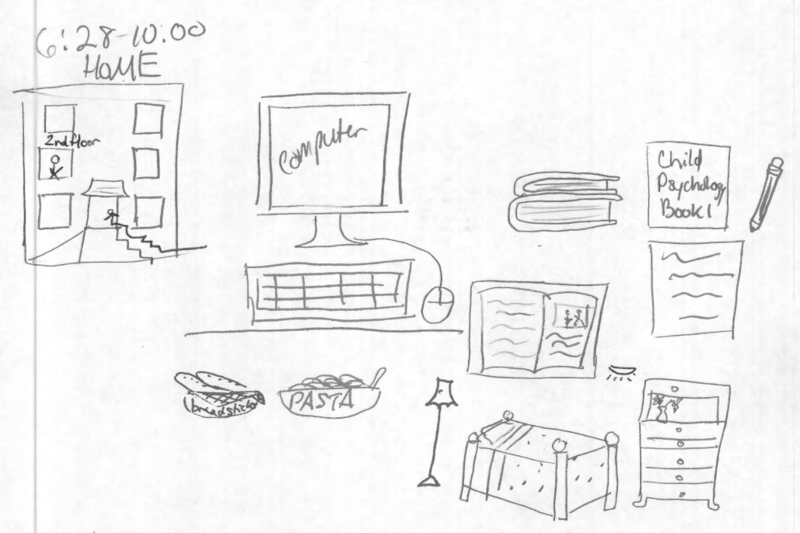 Students who lived at home mentioned their appreciation for the money saved as well as the familiarity of their homes, rooms, and families (also found by Green, 2012, p. 98), yet also noted the inconvenience of commuting to campus and the feeling of disconnection from college life. Since the vast majority of CUNY students live off-campus and commute to college, it is difficult to generalize the definition, physical layout, or social structure of home for all CUNY students. Almost all of the students we spoke with lived in one of the four more residential outer boroughs of New York City—The Bronx, Brooklyn, Staten Island, and Queens—either in an apartment or house.3 A small number lived in Manhattan or in one of the surrounding suburbs. High-rise apartment dwelling predominates in New York City; over half of all occupied residences are apartments in buildings with a least ten units (United States Census Bureau, 2012). Surveys conducted by the university have gathered data on the household composition and family obligations for students at the university that can help us envision our students’ residences. While there are differences visible across the six colleges where we interviewed students, broadly speaking the household composition and family obligations for students at each of the campuses are similar: most CUNY undergraduates are unmarried and live with members of their family, most often parents or guardians. A minority of undergraduates support children with whom they may or may not live, a higher number of students at the community colleges and comprehensive college than at the senior colleges. No more than 11% of the undergraduates at CUNY colleges live alone, and 12% or less live with friends or roommates (CUNY Office of Institutional Research and Assessment, 2012b). Most of the students we spoke with preferred to do their academic work at a library, usually their own college library, as we have discussed elsewhere (Regalado & Smale, forthcoming 2015). A similar study at the residential University of Rochester also revealed that more students chose to use the library for their academic work rather than work in their dorm rooms (Briden & George, p. 26, 2013). However, we did meet a sizable number—over a third of the students we interviewed—who most often chose to engage with their academic work at home. The reasons these students gave for choosing to create a learning space at home were varied and centered broadly on themes of comfort, customization, and, ultimately, familiarity. The importance of a location with “a lot of comfort” to accomplish academic work was noted by most of the students who considered home to be the preferred study location rather than the library or elsewhere. Soft seating options emerged as a priority, notably opposed to the straight-backed, unpadded chairs and other furniture often available for student use in the library. Though many academic libraries do offer upholstered armchairs, lounge chairs, or sofas, our observations indicate that these types of seating are in the minority at the six libraries we visited. CUNY libraries are typically highly space-constrained, and since soft seating tends to invite lounging and conversation, many of these libraries have opted not to include soft seating in attempt to maintain a quiet environment for studying students. Many of those students for whom comfort was a priority mentioned a preference for studying on a sofa or couch in their homes, most often in their living room or other common area in the apartment or house in which they lived. A remarkable number of students indicated that their own bed was the preferred study location at home; numerous students photographed their beds for the prompts “your favorite place to study” or “a place at home where you study.” While a bed is certainly comfortable, given its association with sleep it is perhaps not the home location most conducive to work, as a couple of students pointed out to us during their interviews. Those students who preferred to study on their beds may also appreciate the privacy afforded to them in their bedrooms, even those who share a bedroom, though none mentioned that in our interviews. Well, now that you’re talking about libraries, in general I prefer studying in my bed than at the library. Just because this library specifically doesn’t have many comfortable seats. [. . .] And I just really like to be comfortable when I’m studying. The option to eat and drink while engaging in their academic work was also important to those students who liked to study at home, and seemed to fit well with their common desire for a comfortable workspace. For many, access to food and drink was a critical component of their academic workspace, and some preferred to study in the kitchen or dining room of their apartment or house. For these students the academic space was imposed on the food preparation and consumption space that typically predominates in those locations. I love the kitchen. [. . .] Because it’s so close to food. The lighting is really bright, not right there, but the lighting is pretty, it’s like right on top so it hits me, right. [. . .] And, I dunno, just really the food. And it’s comfortable for me ‘cause I’m always in the kitchen eating, so it’s good for me. The ways that each student used their home as an academic workspace also included strategies to customize areas of the apartment or house that were not dedicated to academic activity. As noted above, many students studied in their kitchens or at a common dining table while eating and drinking. Especially in small apartments that may not have dining rooms or room for desks in bedrooms, the common dining table in the kitchen or living area may also be used by the residents of the house for many activities that require the use of a table and chairs. 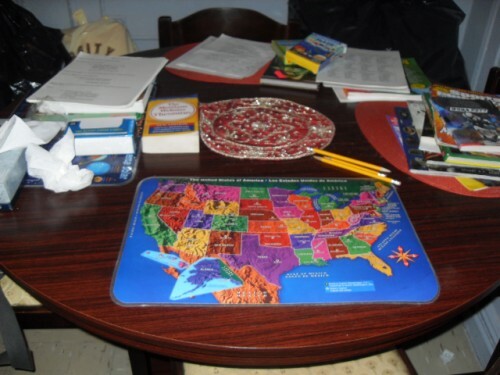 A Bronx CC student described studying at the kitchen table alongside her elementary school-aged child while they both did homework, a strategy that required them to move their academic supplies to another location during mealtimes. Perhaps the most unusual use of residential space for academic activities that we heard about during our research was shared by a Hunter College student who was studying for the MCAT entrance exam for medical school. She had created study guides for herself by writing the materials she needed to memorize for the test onto large sheets of poster board which she hung up in her family’s bathroom so that she could review that content easily in that location. Isabella, a Bronx CC student, shared her preferred workspace at home: the common table in her apartment. She had school-aged children and told us that they would all do their schoolwork together at the table. Time was an important factor for students in considering their preferred learning spaces, and the opportunity to study at a time that was convenient to them was a high priority for students who preferred to do their scholarly work at home. Many students indicated that they simply did not have time to study during the day as school and work schedules did not allow for it. Some wished that their college library was open later—the libraries at the colleges we visited typically close by 11:00 p.m. during the regular semester, with longer hours during exam weeks. However, some students also noted that they did not feel comfortable commuting from campus to their homes late at night, which impacted their choice of study location even with longer library hours. 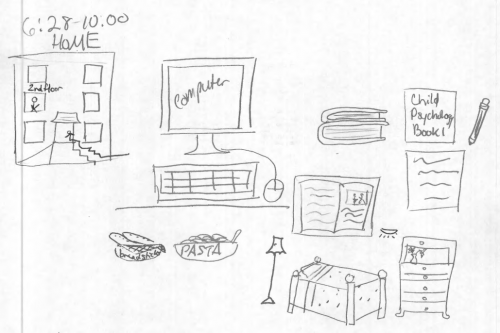 On the fifth page of her mapping diary Sarah, a City College student, drew some of the frequently mentioned comforts of home, including food, bed, and lighting. Ultimately, the reasons cited by the students we met who showed a strong preference for doing their academic work at their apartment or house converged on the theme of familiarity. Home was a familiar place, comfortable and easy to customize, and always open with food and drink available. For these students, the familiarity of their homes gave them a sense of ease while studying that outweighed any potential negative aspects of creating learning spaces at their residence. Students expressed this to us in many different ways, all of which suggest that at home it was easier for them to get their schoolwork done without having to make adjustments based on location. Yeah, I’d rather study at home. [. . .] It’s more comfortable, and it’s not a lot to adjust to, it’s just at home, you already know the environment. While some students were able to successfully create an academic space in their homes, we spoke with others who were frustrated by their attempts to get scholarly work done at home in locations primarily associated with residential, family, or leisure activities. For some students it was the physical limitations of home that constrained its use for academic purposes. We met students who did not have a desk to use for their schoolwork, perhaps the piece of furniture most often associated with the activities of a scholar. Other students we spoke with did not have access to a bookshelf, drawer, or other expected items of furniture to store their academic books, folders, and other supplies. A City Tech student noted that while she did not have a desk for herself in her room, there was a child-sized desk for her daughter there. A Brooklyn College student shared his school materials storage solution with us: the ottoman in his family’s living room, which opened up to reveal storage space. The component of the residential landscape that seemed to impact most significantly on students creating academic space was the presence of the multiple other people engaged in a variety of actions and activities. This affected each student in different, sometimes concurrent, ways. Some students lacked the privacy they desired to accomplish their academic work, perhaps sharing a bedroom or desk with one or more people. Indeed, the space constraints of city living emerged in the accounts of a number of students, in particular those whose personal and sleeping space was also a common living area, as this Bronx CC student notes about studying at home where the living room is also his bedroom. I mean, it depends on . . . ’cause sometimes my cousin can have company coming in and out of the house. “What’s up bro? What’s up bro?” Every five minutes, you know? [. . .] Then sometimes it could be . . . I dunno. Just what I need. Sometimes I need to be at home. I need to study and to be outside the school. ‘Cause sometimes it’s even more so at the school, whereas at home there’s only four people that are in the house at any given moment. While some students were unaffected by competing activities in the kitchen or dining room at home, one Hunter College student revealed that the ability to eat and drink whenever the impulse struck her drove her to study in the library. Indeed, none of the college libraries allowed food or included a café or other eating options within the library itself. Interviewer: And if you had a choice would you prefer to study at home, or study here on campus somewhere? Student: I would prefer to study on campus because I find that I’m much more productive on campus. The main reason is because the campus doesn’t have a refrigerator. I tend to have a lot of things to snack on when I’m doing work at home, so then I’m halfway through my work and I realize I have no snacks. Then I go to the kitchen, but then on the way to the kitchen I get distracted by other things . . . like the TV. And then, I’m like, “Huh, let me sit down and have my snack and watch TV,” and my work never gets done. But [on campus], since there’s no kitchen I can’t get distracted. Just sit at my desk and do what I do. Many students shared information and communications technologies necessary for their academic work—most often desktop computers, laptops, or printers—with some or all of the residents of their homes. Students’ access to these technologies was thus not always unimpeded, and they sometimes had to schedule their academic work around their family members’ or roommates’ competing needs. Further, the noise produced by the non-academic activities of other members of the household, noise from televisions, video games, conversations, and others, was also noted by some students as a potential (and actual) distraction. Both students who had a private bedroom and those who did not mentioned that the members of their household engaged in activities that produced noise, sometimes to an extent that each found disruptive to their scholarly work. The need to negotiate use of home spaces is highlighted by a Brooklyn College student. My house is very noisy, it’s a lot of noise, and the thing about it is if I can’t study on campus, I would go home and sit in this little corner [. . .] everybody knows that while I’m in the living room and I’m studying, they can’t come in and watch T.V. Damarae, a Brooklyn College student, photographed a small side table in his living room in response to the prompt, “your favorite place to study;” note the TV visible on the left. Finally, because creating an academic space at home was often a challenge and a frustration for students who did not have a private room in their home, some students ended up using the college library even when it was not their first choice, though others made do at home. The challenge of finding an adequate place to create academic space was met creatively by one successful Bronx CC student we spoke with, who had several younger siblings at home, but the same solution would not work for many. Interviewer: “A place at home where you study.” What is this place? . . . It looks like the hallway outside your apartment. 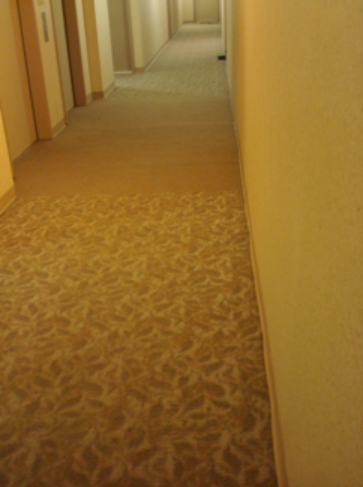 Audrey, a Bronx CC student, took a photo of the the hallway of her apartment building where she sometimes does her academic work in order to avoid noisy younger siblings. While many CUNY students preferred to study in the comfort of their own homes, for others the college library represented the best possible option for an effective study space. What can college and university libraries, and campuses more generally, learn from the experiences of the students we interviewed? One possibility is to consider initiatives that create a home-like or dormitory-like experience on campus for commuter students. Seattle University’s Collegium program provides “home-like environments in which commuter and transfer students can renew themselves between classes, meet with classmates and faculty in a relaxed setting, have conversations with friends, [and] enjoy a snack” (Seattle University, 2013). The Collegium program uses space on campus, not in the library, but perhaps library space could be converted to meet some of these needs, too. Commuter students will likely always have the need to engage in some coursework at home, despite the distractions and constraints that many experience when they attempt to construct learning spaces there. While some students can be successful using the college library as a learning space, others cannot. To better accommodate commuter students within the bounds of the campus it is worthwhile to consider how to ensure that the library is an inviting location in which students can successfully accomplish their academic work. Indeed, recent research on student retention confirms the critical importance of “adequate facilities in the library, student center, and academic buildings for students to study, type papers, and make copies of course materials while on campus,” that “are open around times that classes are scheduled, including in the evenings and on weekends” (Braxton et al., 2014, p. 62). College and university libraries that serve commuter students may consider adding features or services to specifically accommodate their needs. Lockers or lockable carrels that can be reserved by students may relieve them of the need to carry their readings and other course supplies back and forth between home and school. Study rooms or other spaces for solo (rather than group) use may provide the opportunity for students to spread out in the way that is most comfortable for them. Quiet workspace in college or library computer labs may also be useful to students and, if not possible, perhaps laptop or other device loans can fulfill students’ needs for academic access to computers. It is important to note the tensions that may emerge when considering a comfortable space for commuter students to accomplish their academic work in the college or university library. Many institutions with large commuter populations may not have the physical space or the financial ability to create ample space for students to lounge, eat, relax, and otherwise unwind between their academic commitments. As a location on campus that is generally considered to be quiet, safe, and (we hope) inviting to students, the tendency to use any “comfortable space” in the library as a lounge will likely always be strong for students who truly need such a space. However, on campuses that experience extreme space constraints, as is true at some CUNY colleges, adding comfortable seating may encourage conversation and lead to conflict with students who rely on the library as a quiet place for their academic work. Additionally, while allowing food and drink in the library might be seen by some students as encouraging leisure activity, for others eating while studying may be an essential part of how they make their academic space work for them. Small libraries in large colleges must grapple with these tensions as they consider how best to configure their limited physical spaces. Local conditions and student needs are likely to vary a great deal, thus even a brief user inquiry is valuable to ensure that decisions about how to shape campus spaces are based on actual student needs not just those assumed by college faculty, staff, and administrators (cf. Foster & Gibbons, 2007). At City Tech we are using the results of this research as we plan to renovate one area of the library to provide more seating and study options for students. At Brooklyn College our research results have already informed small scale decisions such as the addition of express computers for email and quick printing without sign-in; they are also being brought to the table as we develop a strategic space plan, including a possible re-consideration of our no-food policy. As our research has shown, understanding the commuter student experience off-campus can provide invaluable data to inform the creation and maintenance of appropriate learning spaces for commuter students on campus. This article was strengthened by the thoughtful and insightful feedback of our external peer reviewer Henry Delcore, our Lead Pipe peer reviewer Erin Dorney, and our Lead Pipe editor Ellie Collier. Many thanks for working with us! We would also like to thank the CUNY students and faculty we interviewed for their time and effort spent speaking with us, taking photos, and drawing their experiences. We appreciate their willingness to share and the opportunities that this project has provided us to make improvements in our libraries. This work has been supported in part by grants from The City University of New York PSC-CUNY Research Award Program as well as a CUNY Fellowship Leave. Braxton, J. M., Doyle, W. R., Hartley, III, H. V., Hirschy, A. S., Jones, W. A., & McLendon, M. K. (2014). Rethinking college student retention. San Francisco: Jossey-Bass. Green, D. (2012). Supporting the academic success of Hispanic students. In L. M. Duke and A. D. Asher (Eds. ), College libraries and student culture: What we now know (pp. 87-108). Chicago: American Library Association. Krause, K. D. (2007). Social involvement and commuter students: The first-year student voice. Journal of the First-Year Experience & Students in Transition, 19(1), 27–45. Mizrachi, D. (2011). How do they manage it? An exploratory study of undergraduate students in their personal academic information ecologies (Dissertation). University of California, Los Angeles. Thank you for this valuable work. It is vital that we have ethnographic studies like this to share with administration. Thanks Linda, we’re so glad you’ve found it useful! We really enjoyed working with BMCC students on this project, they’re terrific. Back in ancient history, when I went to Hunter (graduated 1970) and lived in Brooklyn, a lot of reading assignments were done on the subway. Hi Susan, thanks for reading our article. Yes, that was my experience as a grad student in the 90s and 00s as well, and we heard lots of students share that they did as much work as they could on the subway. Crowding conditions and lack of seats sometimes stymied them, though.